There is no way to deny the importance of protein in our diets. Even if you are not interested in becoming a bodybuilder, you need to have a certain amount of muscle in your body in order to perform any kind of physical task without too much effort. Without protein there is no muscle and there is no energy to fuel your body. In this article we are going to tell you 10 reasons why you need to make sure that you can eat protein. If you feel that your muscle mass is lower than the optimal levels you require, we suggest that you take the time to evaluate if your protein consumption is higher enough to promote muscle growth. Fish and chicken are too of the healthiest sources of protein available. Obviously you should always consume heathy doses of protein, but even high doses daily are not going to be harmful to your body as long as you are an active person. Protein provides our bodies with the most important building blocks that are required in order to strengthen our ligaments, tendons and of course our muscles. This is the reason why powerlifters are on diets that have such a high protein level. 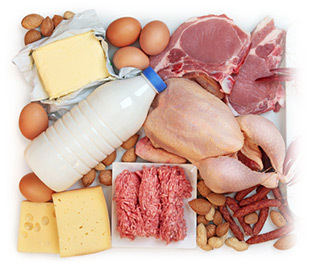 If you are injured in any way, your body will be able to repair itself much faster when you consume plenty of protein. Protein provides the building blocks that you need in order to repair tissue after injury. When you maintain a good level of protein consumption in your life, you will be able to maintain a level of fitness even when you reach your senior years. The beauty of protein is that it will not only help you gain muscle. It will also help you reduce your levels of body fat and it will keep you much healthier. Protein helps reduce junk food cravings. This is the reason why a clean diet with high protein doses is highly recommended by fitness trainers. It has been proven that a good amount of daily protein intake will help reduce blood pressure significantly and this is very important if you want to avoid all kinds of heart disease complication that could strike earlier than some people even expect. Protein is an amazing booster for your metabolism and this is the main reason why you need to consider it essential for your daily diet. It turn your body into a lean fat burning machine that is unstoppable. When you consume plenty of protein, you will start to notice that you don’t crave junk food anymore because your body takes longer to digest foods with high protein content. The consumption of protein is essential to ensure that your bones are stronger and heathier. It has been proven to help prevent osteoporosis and it allows people to stay active even at older ages without fear of their bones breaking easily. There should be no doubt in your mind at this point that you are going to see a large number of benefits from incorporating plenty of protein into your daily diet. A good amount of protein daily could be between 60 and 80 grams for an adult in order to gain full benefits from its consumption.